When some non-aquarists hear “Angelfish” their thoughts turn to the multi-colored saltwater fish of the tropics of which there are over 30 varieties. None of those saltwater varieties are actually Anglefish, in name or species, but simply nicknames given them throughout the years of reef observations. The common aquarium Angelfish is probably originally bred from P. eimekei or a P. scalare hybrid. With its long, wing-like fins, stately manner, and distinctive markings, the Angelfish is indeed an angel of the community aquarium. Some ichthyologists say that there are three distinct species of Angelfish. All three are very similar, and so far, as the aquarist is concerned, there is only one freshwater Angelfish. This is because the species has been crossbred on farms and raised with breeders for over 100 years that any separation of the species is long gone. Angelfish have a rather wide distribution in the wild, common throughout the Amazon River and its tributaries, northward to Venezuela and the Guianas. Seen in the wild, it is obvious they are well adapted to living in their native waters, they prefer well-planted aquariums with long broad-leafed plants, rock formations, and flat leaning slate. Angelfish live along the shores of rivers and ponds, where masses of plants grow right out of the water. Distinctive stripes and why they developed. 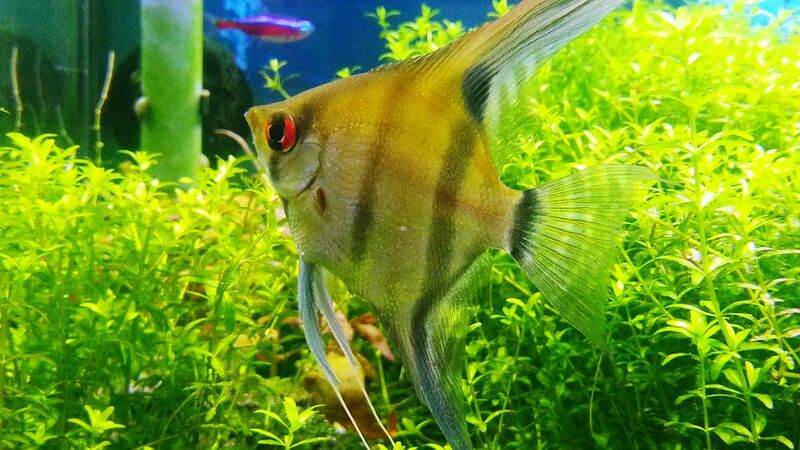 With their high, thin proportions, Angelfish can swim far in among the plants, where they are safe from larger fish. The black vertical bands provide protective coloration so that they blend into their surroundings. Angelfish have the ability to turn their black bars on and off at will. If they are severely frightened, they may turn pale and lie flat on the bottom for a while as if in a faint. The best time to see angelfish without their black bars is at night after all the lights have been turned off. When the light is turned on, the fish are likely to be nearly white, and they may be resting on the bottom. One of the proofs that fish probably sleep is the Freshwater Angelfish, when the lights of an aquarium are turned off and the room is dark, lose all color and fall motionless to the bottom. When the light is turned on, they startle to life, the black stripes returning quickly as if roused suddenly from deep sleep. Despite this speculation, it is still largely unknown. Do angelfish in stores come from the wild? Freshwater Angelfish have been produced in this country for so long that wild Angelfish are only occasionally imported at great expense. Wild specimens are considered novelties for public aquariums, Ichthyologists experiments, and to strengthen professional breeders lines. The wild Scalare is relatively unattractive compared to what breeders produce today, short stubby fins, much less distinct colors and much harder to keep in captivity. Like most things in the freshwater aquarium hobby, the fish come from nature-friendly fish farms. It is not difficult to breed Freshwater Angelfish if they are allowed to choose their own mates and if they are well fed. Angelfish have interesting breeding habits, and they are very devoted parents. The best pairs tend to the raising of their brood until the young are old enough to be sold in stores. Generally, a piece of slate about three inches wide and a foot long is placed in the aquarium, leaning against one of the glass sides of the aquarium. If a broadleaf plant, such as an Amazon Swordplant, is in the aquarium, the parents may prefer it to the slate. The sexes in Freshwater Angelfish are very difficult to distinguish. The only really reliable difference is the swollen abdomen of the female as her eggs reach maturity. At breeding time, the female develops a short spawning tube (ovipositor). The spawning site (slate or leaf) is carefully cleaned by both parents. Then, the female moves over the site and deposits a row of eggs, one egg at a time. The male follows and fertilizes them. More and more rows of eggs are placed until there may be two hundred or more on the site. After the spawning is complete, both parents care for the eggs. Any speck of dirt is removed. Dead eggs are eaten before they can rot and damage the others. The first babies appear in two days or less, and they are attached to the spawning site by a short, sticky thread extending from the baby’s head. The parents keep the babies together until they are free-swimming and they sometimes move the babies from place to place looking for food, herding them like sheep. Some Angelfish are not as good parents as others, and at the slightest disturbance may at any time eat the eggs or their own babies. Because if this risk, most aquarists that want to raise Angelfish to sell, remove the slate or leaf with the eggs to a gallon jar filled with water from the aquarium the spawning took place in. An airstone with a gentle stream of bubbles is placed beneath the eggs to substitute for the cleaning and fanning of the parents. This artificial method denies the aquarist the pleasure of observing the Angelfish’s family life, but it does eliminate the risk of the parents becoming cannibals. Away from the parents, the eggs are likely to be infected with a fungus disease; thus a few drops of a fungus-killing chemical are usually added to the water in the jar. Leave the parents with their eggs, unless you really want 200 Angelfish for some reason, let me tell you why. Since the Angelfish you buy are most likely 50th generation tank raised, they are not going to be easily startled, so the chances are they will take care of their eggs until hatching. If you try the jar method, you will lose the eggs the first second and probably the third time until you get the bubbles and anti-fungus just right. Once the young hatch, you are not equipped to handle the “wiggler” stage, you will lose them in this stage before they are free swimming, the parents will have no problem, with them. Once the parents are leading the young around the tank the danger is over, and the parents are actively helping the young find food all the time. You want to experience nature; nature has Angelfish raise their young, experience it as it was meant to be. Besides, a good mature pair of well fed and conditioned Freshwater Angelfish in prime breeding condition will try again every 19 to 21 days if they mess up the first time and eat their eggs, they are just kids, give them a chance or two, they will get it right! In any case, when you see the young off on their own and no longer taking direction from the parents, they must be separated. It is at this point that the “kids” have left the nest, and are now just a potential danger for the pairs next spawning, so remove the young to a grow out tank, and watch the fun all over again. Are different looking angelfish the same species? Over the years, many interesting varieties of Freshwater Angelfish have been developed by skillful selective breeding. One, the Veiltail Angelfish, was developed in Germany and was first brought to the United States by the aquarist William Sternke in 1957. In the Veiltail Angelfish, all of the fins are two or three times longer than the fins of normal Angelfish. Another variety, a jet black version of the Freshwater Angelfish which, at it’s best, is 100% black was developed. Naturally, it was not long until breeders had the black Veiltail Angelfish, then the black lace and the Koi, the golden and the red and chocolate. The question, however, was, “are they all the same species,” and the answer is “yes.” Any male and female that “chose” each other and pair off can breed, lay eggs and have a fertile spawning. Now if you have a male black Veiltail and a female common Koi, there is no telling what the young will look like. To some of us, that is the fun of breeding. In any of its varieties, the Freshwater Angelfish would surely be among the five most popular aquarium fish. No community aquarium is complete without a few. Take care; full-grown, these fish are over 5 inches and with full Veiltail they can be up to 9 from tip to tip. Angelfish are meant for ​larger aquariums with both height and length so these magnificent fish can swim and play the way nature intended. Even though smaller fish like tetras and barbs will live quite well with Angelfish (they come from the same place, the Amazon) we do not recommend Guppies and other small fish such as Whitecloud and Zebra Danios.